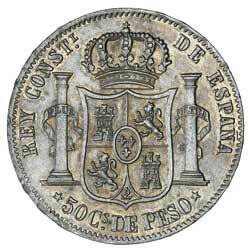 PHILIPPINES, Alfonso XII, fifty centimes, 1885 (KM.150). Underlying mint bloom, slight toning, nearly uncirculated. PHILIPPINES, Isabel II, fifty centimes, 1868 (KM.147). Peripheral tone, good extremely fine. 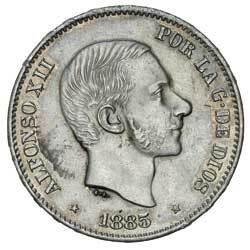 PHILIPPINES, Alfonso XII, twenty centimes, 1885 (KM.149). Good extremely fine. PHILIPPINES, US Administration, ten centavos, 1904 (KM.165). Deeply toned proof-like, FDC and rare thus.